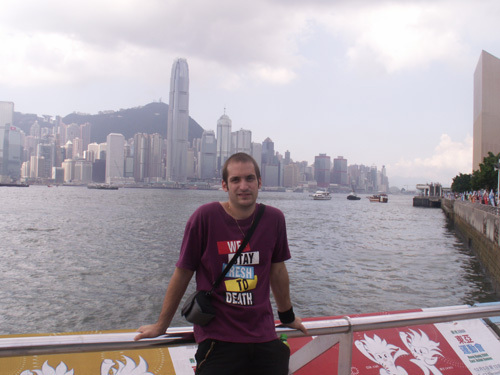 My name is Gabrijel, 26, I come from Italy but I’m of Slovenian origin, so I can speak both languages fluently. Since I was a kid I dreamed about traveling the world. After graduating from high school I started to move from one to another country. The first time I came to china was about 5 years ago, because of one girl. I still don't know whether that was my luck or my disgrace. Whatever, I’m in china now. My life is very busy and tiring. The two guys I live with don't like cleaning, so I gave up long time ago as well. I have business Chinese classes every morning, after class I run to another school to teach English, and if I am not tired to death, I have a quick look at the textbooks in the evenings. My everyday is pretty much the same. When weekend finally arrives, I go to the usual barbecue to get drunk with my Chinese and foreign friends, I don't even finish my last bottle of beer in some club that a new week starts. Sometimes I like to play football, but I can’t run too much as my physical condition has been heavily damaged by my unhealthy lifestyle. My biggest hobby is learning foreign languages. I can speak four languages fluently, including Chinese, as well as quite a lot of Cantonese especially swear words, I’m an expert on that field! After I graduate from guangwai I want to travel everywhere in china and around the world, and find some pretty girls to stay with, but first of all I need a good job, cause as we all know, no money no honey!